We’re now taking orders for Taunton magazines at special group rates. These rates represent a 20% discount off the regular subscription prices and are applicable to both new and renewal subscriptions on any magazine that Taunton publishes. Since we do this only once a year, in February, you may wish to renew now, even if your subscription expires midyear – Taunton will simple add to your current term. In the interest of starting the new Year off right I have pulled the files used in the creation of our knife box project into a single mailing. I had to reduce their sizes with Acrobat Pro for them to mailable. Also some members don’t have high speed internet so the smaller size works for them. Some of the documents were poor to start with and did not degrade when I downsized them. The project knife box exterior is complete and I like it. This will definitely be a part of the March exhibit at Woodcraft Newington. Our next meeting is Feb 23rd and an excellent opportunity for everyone to bring in a piece for the exhibit to showcase what the Guild members can accomplish. As an FYI we now have our own projector for presentations and guest presenters. I did spend an extra 10% over what we had talked about in the interest of getting a device with LED projection and good platform compatibility. I learned that the lamps in the non LED projectors cost nearly as much as a projector and the lifetime of the lamps were not very long. Our projector LED light source has a 50000 hour life and 4200 lumens. This should allow us to view our programs without putting everyone to sleep in the dark. We will still need a laptop to play a DVD or the DVD data stored on a USB memory stick or drive. I am still working on the next meeting agenda but be prepared for discussion on future projects and learning. Some PFG members were interested in building a jewelry box using some of the knife box features. I am working on a jewelry chest that does that. Make yourself known to me and I will get you in the loop. There will not be a detailed computer drawing of this chest because I don’t enjoy spending my time that way. I am a napkin engineer/woodworker. I feel my time is better spent in the shop. 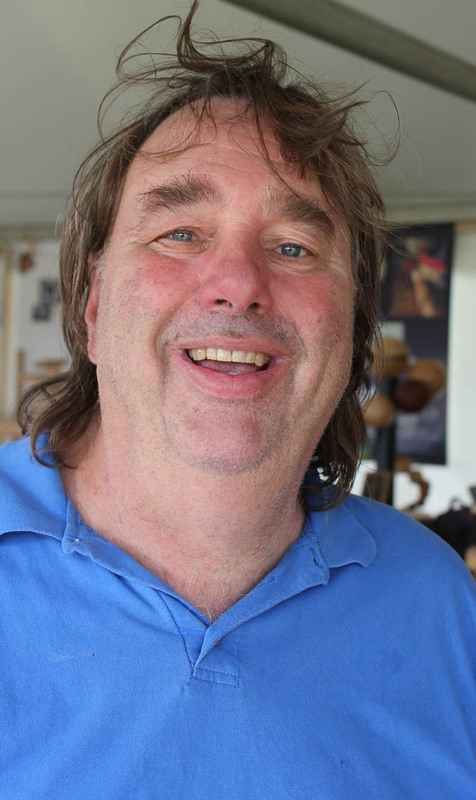 Both meetings were held at Bob LaCivita’s workshop in Rollinsford. The October WFG meeting began with a demonstration on how to make the mortise and tenon door frame with grooved rails and styles. Bob explained that when using honched tenons, they would be honched on the outside edge. 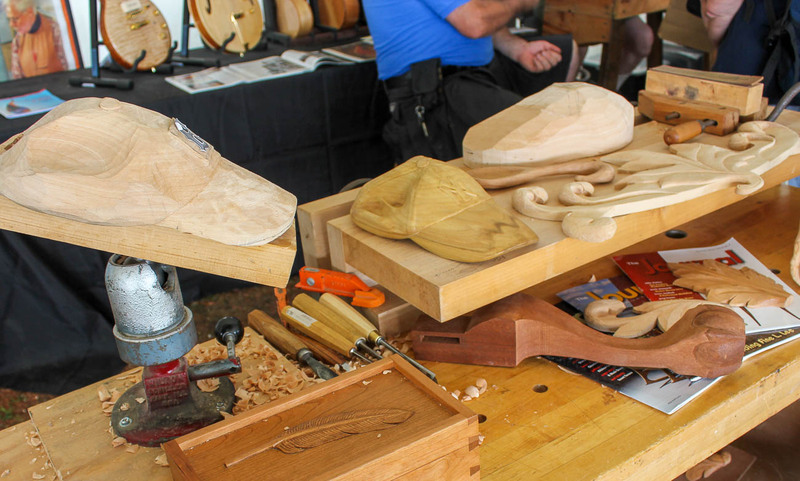 An alternative frame style, the cope and stick (Figure 1), using paired router (or shaper) bit sets, was also discussed and demonstrated in this session. Bob explains and cautions us when using the cope and stick method, to feed the rails and styles through the router bit very slowly, and to cut the copes into the rails first. Flat panels and bolection (Figure 2) panels were also discussed during this session. Figure 1. Cope and Stick frame. Figure 2. Bolection molding incorporated into flat panel frame. We then reviewed proper allowances for wood movement of the panel within the door frame grooves; 1/8” per foot for across grain and 1/64” per foot lengthwise. The panel rests in grooves that are cut to 3/8” depth in the door frame. Before glue up of the door frame joinery, Bob recommended we do one or two passes of a hand plane to clean up saw marks from the inside edges of rails and styles. One additional step recommended prior to glue up of the door frame, the panel should be finished. Final assembly requires precise application of glue to the frame joinery, carefully keeping glue off the panel. Similarly, final finishing of the door frame requires careful application of the finish to portions of frame that are adjacent to the panel within the door frame. By following these steps, the panel should fit snugly within the frame, but be free to expand and contract within grooves of he frame. The December WFG meeting was a continuation of our discussion and demonstration related to making paneled cabinet doors. 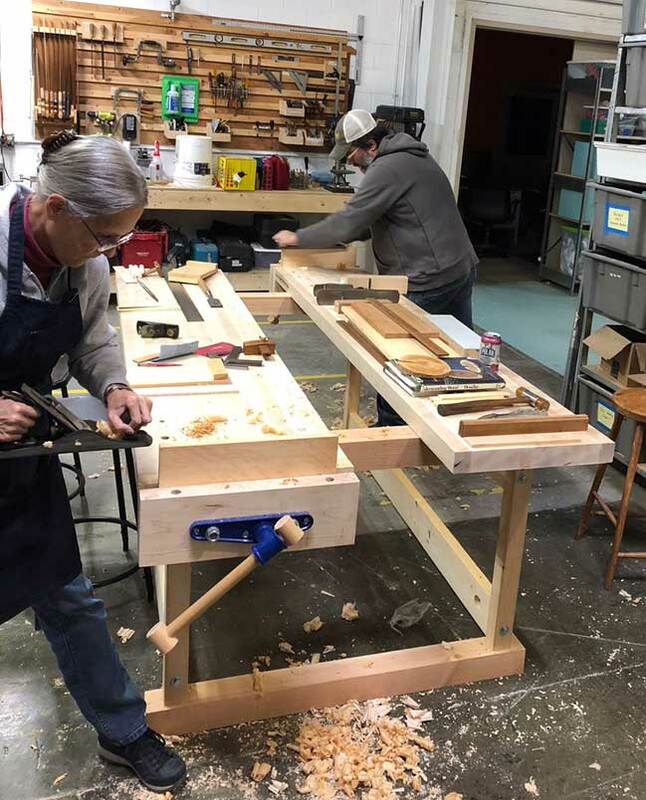 Today’s focus was on a few different methods on how to make a raised panel for the door frames we made during demonstrations at the previous meeting. Bob began by making a raised panel, using the shaper. The shaper cuts panels with consistency difficult to achieve using other alternatives. 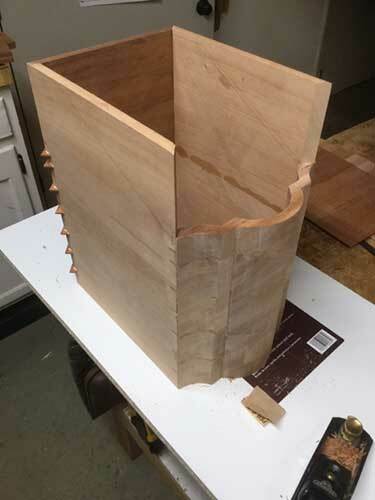 After setting up the shaper, an end-grain edge of a panel blank was fed through the shaper to make the first cut of the profile. Rotating the panel 90 degrees, the first long-grain edge is fed into the shaper, leading with the previously shaped edge. Bob notes that any end-grain tear out from the first cut disappears with the second cut. The final two edges were similarly fed through the shaper to complete the profile of the raised panel (Figure 3). The panel was successfully dry fit into a mortise and tenon door frame made during the October WFG meeting. Figure 3. Raised panel made on the shaper. 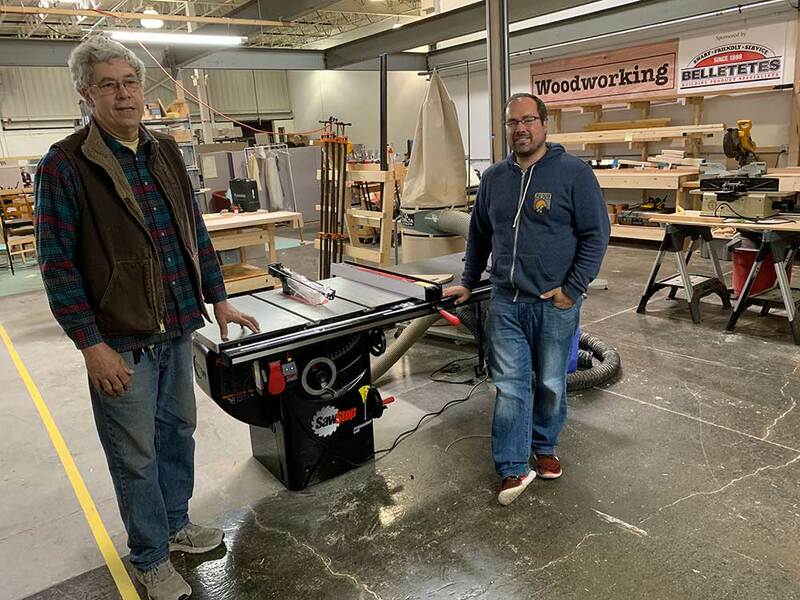 Acknowledging that most of us probably do not have shaper tables in our shops, Bob shared a few alternatives for us to make a raised panel. 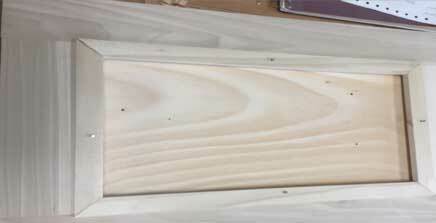 A router table, a table saw, or hand tools could be used to make a raised panel. He cautioned us about the inherent risks of using a router table to make raised panels. Safely controlling a panel while its edge is being fed into and through the large exposed router cutter is a dangerous challenge for even the most experienced woodworker/operator. Next, Bob shows us how to shape the raised panel profile using the table saw. First, using his marking gauge, he measures critical points from the raised panel he just made on the shaper and marks the layout for the next raised panel. The first table saw cuts are set at 3/32” depth to define the perimeter of the raised portion of the panel. 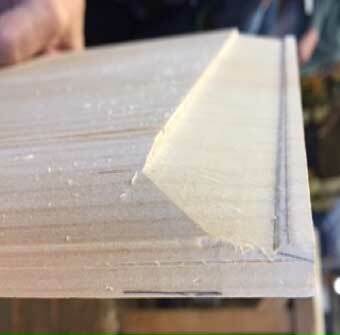 For expediency, Bob completes two of the four bevel cuts, one cut along an end-grain edge and one along a long-grain edge, using the table saw with the saw blade adjusted to cut up to the 3/32” cuts (Figure 4). Figure 4. Raised panel with two of four bevel edge cuts done on the table saw. 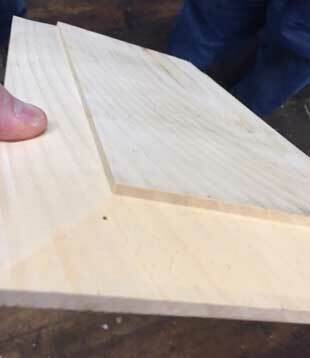 For the final two edges, he demonstrates how to complete the raised panel profile shaping with hand tools. 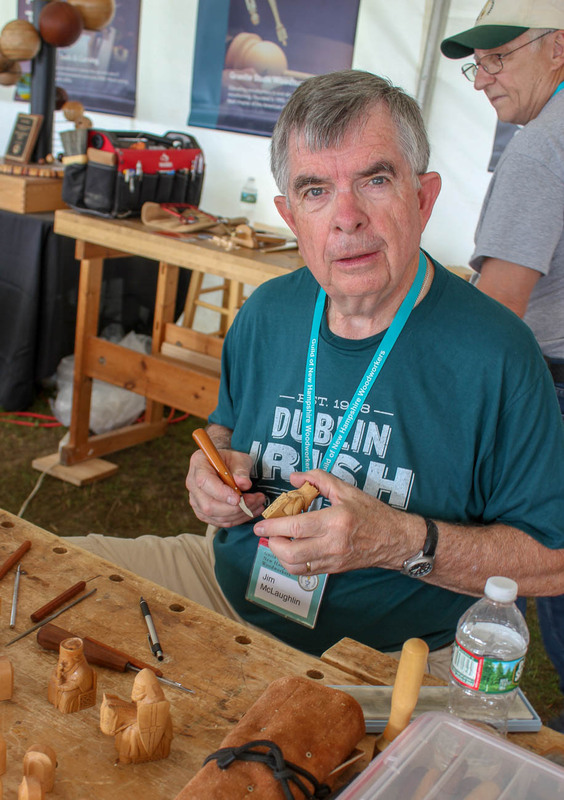 Bob uses a paring chisel to hog off much of the waste wood before switching to a rabbit plane and his #4 bench plane to clean up any remaining waste to the layout lines (Figure 5). The second panel is dry fit, and then glued into a door frame. Figure 5. Raised panel bevel being shaped using rabbit plane. To close out the meeting Bob gave us a brief introduction into the first topic of our next meeting, hinges and door hardware. Following the discussion related to door hardware, the WFG meeting will begin a new series of discussion and demonstrations on joinery techniques. The next meeting is on February 2, 2019. We welcome newcomers, regulars and guests. 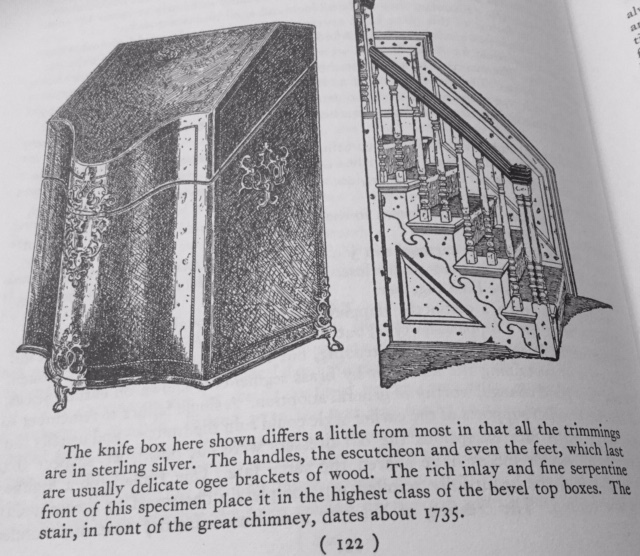 Since my dive into the PFG project of building a knife box I also have uncovered this information about the evolution and story of the knife box. I have had some good fortune of finding this information in old throw away library books by Edgar D Miller Jr , Wallace Nutting and Edgar P. Fitzgerald. Some I have purchased when rummaging in antique shop book racks. The evolution begins with the sideboard. 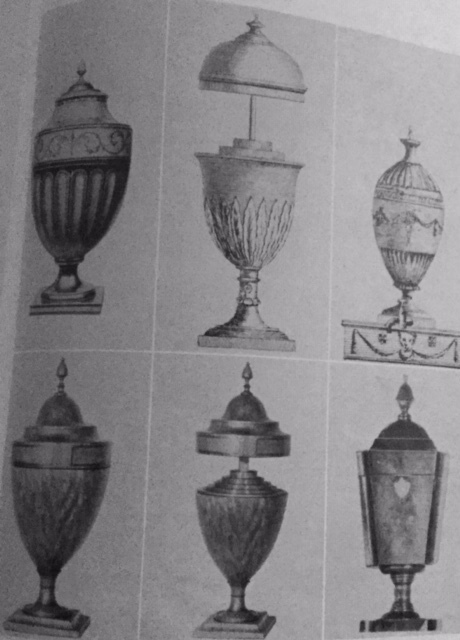 In the picture A the sideboard and and cupboard or pedestal appears upon which an urn is sitting. Note the sideboard and cupboards are not connected. 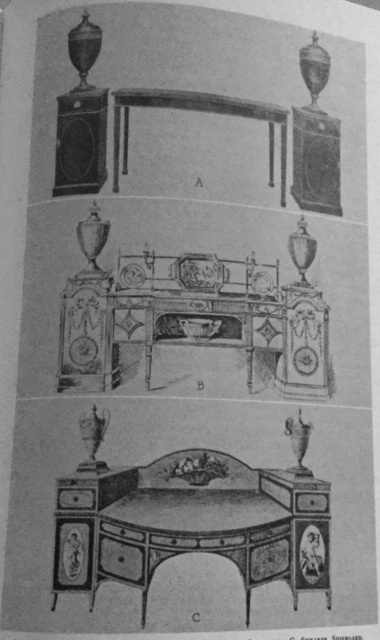 Robert Adam connected the cupboards to the sideboard making the set of 3 pieces and not 5 as shown in picture B. The next form was in picture C by Thomas Shearer a contemporary of Hepplewhite’s. Of course these are all Englishmen. Shearer later made just the sideboard without the cupboards and urns. Shearer and the Adam’s work was overshadowed by Hepplewhite and Sheraton. Shearer and Adams fade into obscurity. The urn style of knife box were the first in the evolution. This seems to have evolved from the use of lead lined urns with a faucet to draw out “ice” water. Ice water was a treat and was fittingly withdrawn from these fancy urns. The faucet is seen in the following picture upper right. About 1785 is the best date I have for the beginning of these vessels. These are mentioned in Hepplewhite’s Guide or maybe more accurately stated, “his wife’s guide”. In history she appears to be the author. The urns have their own evolution when later they were made spring loaded with expanding internal compartments for silverware and utensils for use at the dinner table. These are seen expanded in the center pictures above. The bottom center picture is in a Sheraton style. Although called knife boxes and knife urns they were used for keeping forks and spoons as well as knives. As the evolution continues the development of the sloped front knife box is seen. Hepplewhite and Sheraton are again the primary designers. These items were made from mahogany and or satinwood. Other woods were only used in the inlays and not construction. 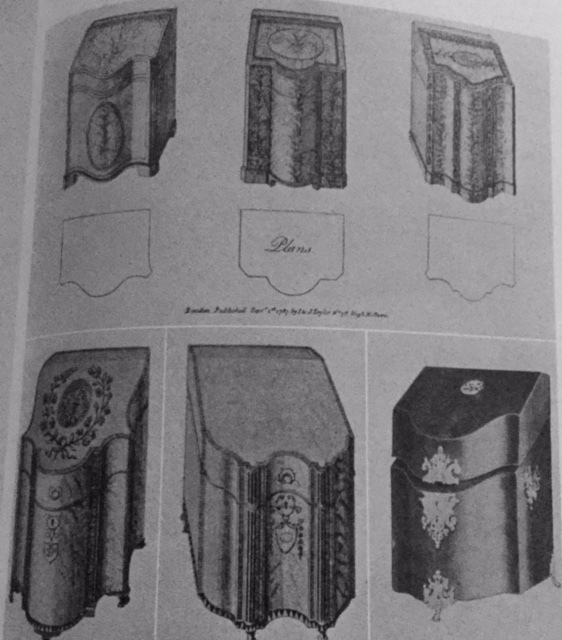 The first line of knife boxes in the picture below are designs from Hepplewhite’s book. Note in the plans how they began as serpentine form and morphed into a “broken” serpentine form. Some have feet some do not. Sheraton liked his feet! The bottom line of boxes are Sheraton’s boxes with the use of silver adornments making an appearance. I believe this last picture is also a Sheraton but from a different publication. The picture of the stairs has no relevance to this discussion. I just failed to crop it out because I think the stairs are really cool and very ornate. Following the knife urns and boxes was the cellaret. Or in modern terminology a wine cooler. I don’t have pictures of these. In our project knife box example it is stated that it is not a typical knife box. It was made with a white pine body with a mahogany veneer. In the box I have built it is solid mahogany but with a mahogany veneer. Following my study I am pretty certain it was made in the colonies and not England. There were roughly 20 builders of knife boxes in the newly formed states. There were only a few specialists in England and the states who were building these. Our example knife box has elements of both Hepplewhite and Sheraton. I think the states builders were picking and choosing and doing what they liked and would sell. 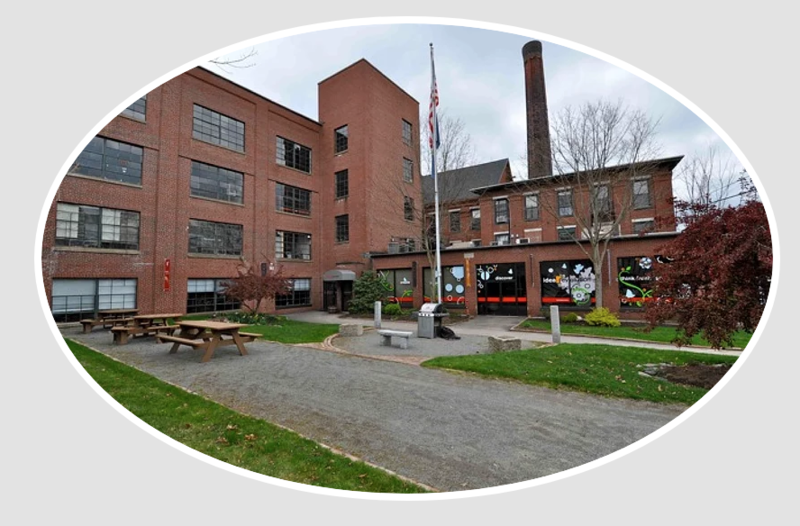 I hope you have found value in this reading and will attend the next PFG meeting Dec 15th in Newington. Lots to discuss and learn as we continue with the knife box project. Also it is not too early to begin to think about our next project and what you would like to have presented at one of our future meetings. 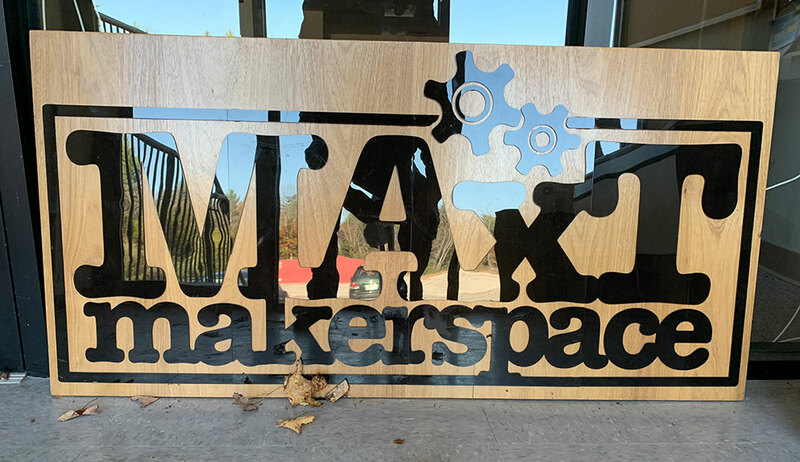 Thanks to GNHW’s generous grant of $1300 for a new Powermatic 14” bandsaw and with the help of Peter James expertise, a new bandsaw has been purchased at Dan’s Max Saver, along with a mobile base, delivered and assembled at the Eastman Lake Boatbuilding shop. 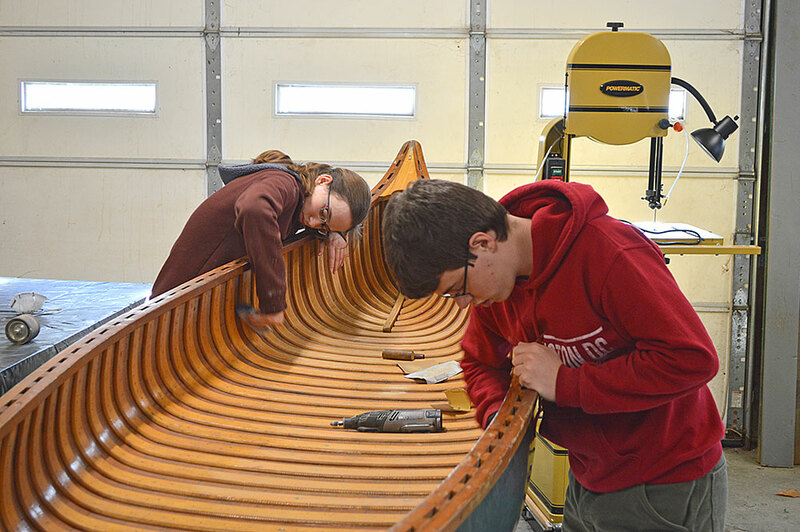 Here is a photo of Anna and Nick restoring a 1969 Old Town Otka canoe with our new Powermatic bandsaw behind them. Have you heard about our Guild Grant Program? This year the fair began Saturday, August 4th and ends Sunday, the 12th. 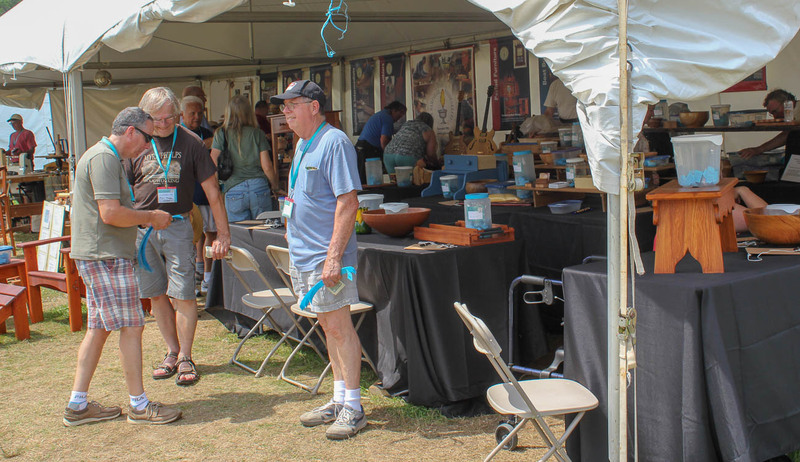 For us, however, it started Friday the 3rd with the set-up once again turned empty space into an amazing venue where fairgoers get to see Guild members demonstrating their woodworking skills. League of NH Craftsmen information here. 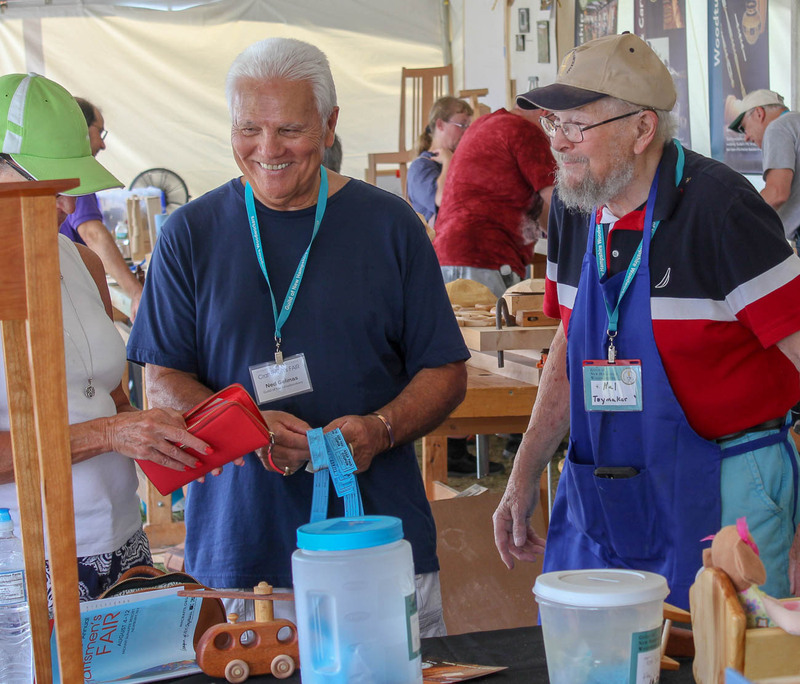 We have Guild member’s work on raffle tables—this is a significant source of income to the Guild’s educational mission. For each of the last several years, more than $13,000 worth of tickets were sold! You see, along with woodworking skills, we are pretty good sales people. Actually, it’s an easy sell, we simply point to your donations. 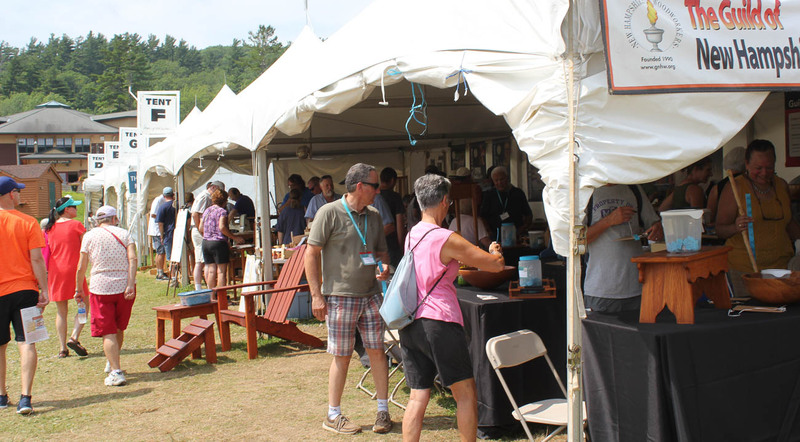 This all takes place at Mount Sunapee Resort, a most beautiful setting. Guild members get to see other crafts and to visit “Living With Craft” exhibition where the Guild awards two prizes each year. See the 2018 winners here. There was discussion about the carcass construction of our project “knife box”. Pros and cons of the orientation of the carcass wood grain was thoroughly discussed as well as the joinery options. For such a “small” item discussion was large. There is much learning in this “small package”. The knife box I am constructing for demo purposes is progressing well. 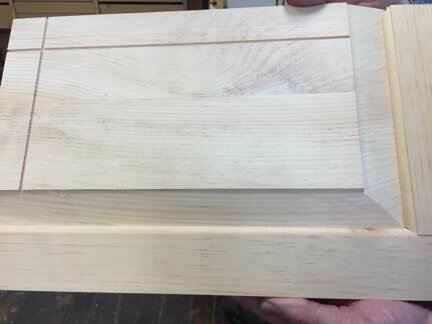 Gary Kokx brought in one of his beautiful knife box builds and graciously even did some disassembly so we could get a peek at the inside construction. Thank you Gary! 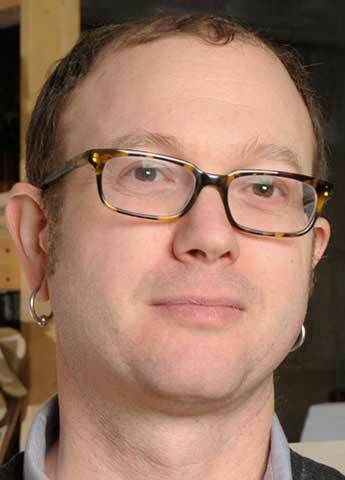 Additionally we viewed videos on a couple methods for lunette banding creation. One in particular was the method likely used when this banding style was originally conceived. Steve Conlin provided the audio visual hardware and videos, plus changed plans to accommodate the meeting schedule. Much appreciation Steve! The next meeting Dec 15 will be to discuss the veneering stage of our demo knife box. This will include installing the lunette banding, purfling and marquetry for our lid. Anyone seeking information on the build may contact me.